Since I started learning to run again in June, all of the my jogging to date has been in the gym during my lunch hour. By the time I walk to the gym, get changed, stretch briefly, allow time to cool down and get changed again – it leaves me with approximately 40 minutes of exercise time. I started out doing short test runs of only 1km, increasing to 2km and have since increased my lunch time running distance to a maximum of 6.5km. I noticed that I seemed to be struggling to get past that distance in my allocated time and figured that I needed to learn to run further, sustaining my energy output for longer, to be able to expend more energy in a shorter period of time by running faster. That lead me to getting up early on the weekend a fortnight ago and embark on a 7.5km run around my neighborhood. I plotted out my running path using Google Maps to provide an estimate of distance and set out at sunrise and returned roughly one hour later. Considering it was my longest run to date, I think I handled it reasonably well. I learned a valuable lesson along the way, take notice of the road names and make sure you enable terrain view in Google Maps. Without realising it, one of the roads I ran had the word ‘mountain’ in it and I can now confirm with absolute certainty that jogging up a 10% incline is really hard work! Following on from the relative success of my 7.5km jog, last weekend I decided I’d see if I could go a little further but making sure it was a little flatter this time and ended up jogging 9.2km. I was definitely feeling the run towards the end but to my surprise, Runkeeper reported that I had a fairly consistent pace of 6:40s per kilometre. I’m fairly happy with how I’m progressing at the moment, nothing too crazy or daring – just slow steady progress. I figure if I just keep working at it and before I know it, a 10km run will feel casual like a 3km one does now. Recently I wrote about how my weight had increased since leaving high school back in 1997, reaching an estimated peak of 120-125kg and in more recent times hovering around the 110kg mark. 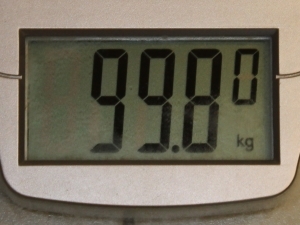 After not doing anything about my weight for such a long time, sitting by passively letting my weight control me, I’ve made some great progress and I now weigh in under 100kg for the first time in over 10 years! My weight loss progress started about this time last year when I began weighing myself semi-regularly and keeping a log of it in a speadsheet. However, it wasn’t until the start of 2011 that I made a conscious effort to not only measure but to actually take action and do something about my weight. That action was a Surfers Paradise gym named Anytime Fitness, which is located in Circle on Cavill near my office. I deliberated long and hard about whether or not I could make a Surfers Paradise gym work for me by going during my lunch hour. Over the years, each time I’ve used a gym on the Gold Coast it has always been either before or after work, so I was sceptical about the prospect of exercising during my lunch break. However it wasn’t possible to go in the morning as Claire likes to go walking & going at night would mean that I wouldn’t see the kids before they go to bed. My only option was lunch time and I was going to make it work for me, because it was time for a change. Between January and April I did nothing but weights at the gym and by pulling my eating back a notch, I managed to lose around 5Kg of weight and put on a bunch of muscle. During May I began introducing a small amount of cardio into my weekly workout schedule, primarily high heart rate cross training. That turned out to be really successful and I lost another 1-2Kg of weight, but more importantly I felt a whole lot fitter on the squash courts. Directly beside the cross trainers are a bunch of treadmills, which I’d been eyeing off for a while. In the past when I walked or jogged, my shin muscles would get incredibly fatigued and it’d stop me from exercising. In the second week of June I thought I’d change it up and went for a walk and to my surprise, my shin muscles didn’t complain. I did that a few more times to make sure it wasn’t a one off and so far my shin muscles haven’t complained.